Beautiful old homes bedecked in Christmas finery and filled with family antiques and auction treasures await visitors on the Holiday Tour of Historic Homes presented by the North Manchester Historical Society, December 4 and December 5. 1999. Martha Miller on East Miami Street and Tim and Jenny Taylor on Beckley Street. New this year is the escorted Candlelight Tour and Dessert on December 4, 4:30 - 8:30 p.m. The Tour will begin at the Strauss Center of the Peabody Retirement Community with a brief talk on the town's architecture. Small groups will then depart to visit the seven homes. Later the 150 tour participants will return to the Strauss Center for desserts and coffee served by the North Manchester Garden Club. Music will be provided by Martha Barker, Kathy Geible and Carol Snodgrass. The second day of touring the historic houses is Dec. 5, ll:30 a.m. to 5:30 p.m. Headquarters for the Sunday tour is the Blocher Community Room at the North Manchester Public Library. Tickets, brochures, refreshments, memorabilia, and a slide presentation of homes from past tours will be available by the Historical Society. Holiday Tour committee members include Laura Rager and Jeanne Andersen, co-chairs; Sheryl Bowman and Ruth Ann Schlitt, publicity; Steve Batska, artistic co-ordinator; Thelma Rohrer and Davonne Rogers, script co-ordinators. Also, Betty Hamlin, tickets; Lois Geible, music; Grace Taylor, refreshments, Grace Kester, special arrangements; and Deb Emmert and Adele Westman, Saturday evening refreshments. The house hostesses include Barb Amiss, Angilee Beery, Sally Krouse, Cheryl Wilson, Susanne Siebrase, Sharon Fruitt, and Shelly Strobel. Brian and Jennifer Pattison's home is a late Italianate brick with a symmetrical front featuring a prominent two-story bay, twin front porches, and limestone foundation and trim. Built around 1883 by Jehiel and Anna Noftzger, it still has the original slate roof. 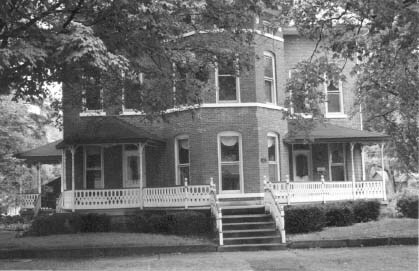 The original square front porch, which hid the bay, was removed in the early 1980s. In 1985 owners David and Sharyn Bowman commissioned their neighbor Allan White to design new porches and railings. These additions enhance the exterior. wood window shutters, poplar wood floors, and a marbleized fireplace. In keeping with their family tradition, the Pattisons will have a large formal Christmas tree in the parlor and the children's tree on the side porch. Local artist Fran Gratz will be decorating the home with natural dried flower and plant creations including wreaths, swags, and small trees. The unique creations are available at the Hospitality House Gift Shop. 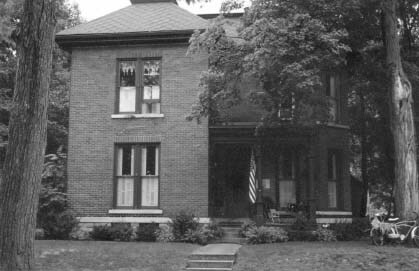 Local merchant Levi Keagle built Jay and Julie Tate's late Italianate style brick home around 1883. The impressive house features an asymmetrical front with the original entrance porch, large bay on the east side, and tall narrow windows with brick pediments and stone lintels. A beautiful leaded glass window sparkles in the porch wall. Julie, who grew up in Wabash County, has loved antiques since a teen. Consequently, the Tate home is filled with not only family antiques but auction and antique shop treasures too. Julie kiddingly says she had to open the Eel River Antique shop on Walnut Street to house the overflow. Interior highlights include oak floors, decorative columns, and woodwork, original inside wooden window shutters, and a charming breakfast room which has a bead board ceiling. 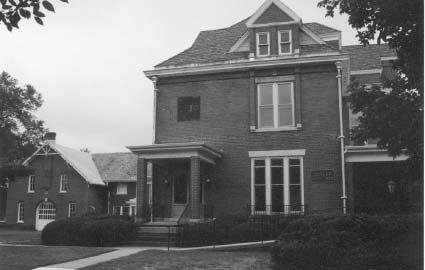 Albert and Mary Ebbinghouse purchased the home in 1907. It remained in their family for 80 years. 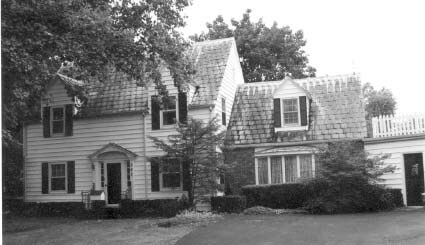 Their daughter Doris and her husband Kurt P. Thoss owned the home from 1938 until Kurt's death in 1987. The Tates bought the house in 1994.
materials by Julie and her mother Sandy Jones will be displayed throughout the house. These decorations will be available at Julie's shop. the stone foundation may be. According to the Wabash County Atlas, some kind of structure was there before 1875. Michael Henney purchased the property, which was part of two acres, in 1903. His son Charles inherited one lot, #25, in 1925. 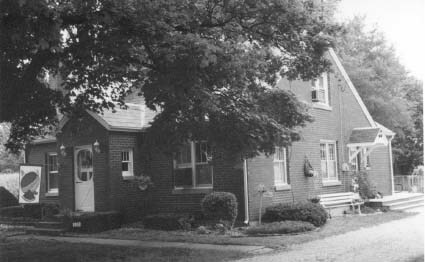 Emera and Isabel Heam bought the dilapidated house in 1938 and proceeded to transform the l l/2 story structure. Heam added the living room fireplace, dormers, new shutters, and sided the exterior, thus changing it to a Colonial Revival house. The next owners, Pat and Crystal Snyder, added the family room, which has exposed ceiling beams from the old Sycamore Golf Course barn, attached garage, and master bedroom in 1972. A swimming pool was completed in 1980. 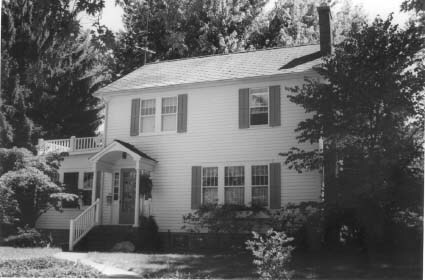 The Goldings purchased the house in 1993. They have blended family antiques with contemporary furnishings, and Valerie's stitchery and other crafts to make a comfortable home. Valerie loves to decorate for Christmas. Her angel and Santa collections are part of the lovely Christmas decor. furniture store and funeral business on Main Street. In the early 1900s he moved the funeral business into the house. George N. Bender bought the property at a tax sale in 1926. His son Todd joined him around 1930 and the name was changed to Bender and Son Funeral Home. 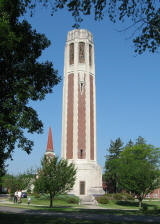 Todd's son-in-law, Mike Snyder, joined him in 1961. Ken and Kathie Grandstaff and Steve and Jan Hentgen acquired the business in 1992. One of their goals is to maintain the integrity of this fine old structure. Special features include original inside wooden window shutters (discovered in the attic), stained glass with painted and etched birds in the double front doors, leaded as well as stained glass windows throughout, four marvelous fireplaces, some with ceramic tile trim, and all original cherry, oak, and walnut woodwork. Jeff and M.A. Hire's farmhouse was built around 1900 by Elijah Shock in the hall and parlor type architecture. This one acre property was part of a 147-acre tract purchased by Jesse L. Williams in 1835. The Hires became owners in 1986. With family help, they have steadily improved the house to better suit their lifestyle and to accommodate their collection of family antiques and auction finds. skillfully refinished many of their antiques. Of special note will be Christmas trees decorated in unusual motifs of Victorian, antique kitchen gadgets, and Mickey Mouse figures. Two antique sleighs from M.A. 's late father Cletus Rager's collection will be on display in the front and back yards. Only two families, both with ties to Manchester College, have owned this lovely Colonial Revival home near the campus. 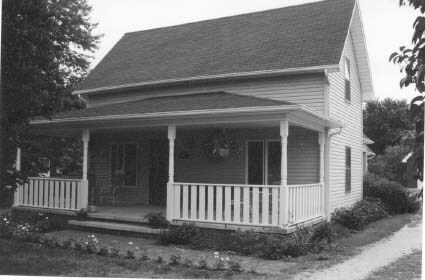 Dr. Ed and Martha Miller purchased the home from the original owners, Professor C. Ray and Annie Keim in 1968.
family antiques including furniture that traveled by covered wagon from Pennsylvania and a treadle sewing machine purchased with proceeds from selling a cow. Ed has beautifully restored many of the family pieces as well as auction finds. Martha, founder and recently retired manager of One World Handcrafts on Main Street, has skillfully blended together all the antiques to make for a very pleasing living environment. Architectural highlights include original oak floors and woodwork throughout, french doors, built-in bookcases flanking the fireplace and in the study, and an inviting window seat in the dining room. 1940s. The school had been built in 1912 and was torn down in 1940. The property is part of a 160-acre parcel first owned by John Delafield in 1837. Tim's materal grandparents, James and Alma Watson, owned the house from 1954-1959. Tim lived there for a week right after his birth. In 1984 the Taylors became owners of this Colonial Revival house. Interesting architectural features include poplar woodwork, stucco walls, unique door archways, and brick fireplace flanked by built-in bookcases. The home is a treasure trove of family antiques such as great grandmother's oak drop leaf table and iron bed and grandmother Taylor's marble top washstand. Other antiques are auction finds, some of which Tim has painstakingly restored. live music at some of the homes. Musicians include the Madrigal Singers under the direction of Carol Streator; Joyce Frye and Karen Eberly, hammered dulcimer: Marci Parker and Katrina Runkle (playing at 3 p.m.) piano.